DolphinNext supports submitting jobs to the Amazon AWS cloud by using Nextflow. It allows you to practically setup, start/stop a computing cluster and run your pipeline in the AWS infrastructure. Clicking on the start/stop button will open new window called Amazon Management Console. Starting and stoping AWS cloud is conducted in Amazon management console. There are two ways to open console. First option is clicking following buttons: profile > run environments > Start/Stop. 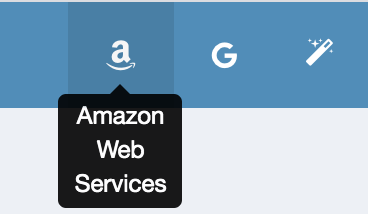 Altervatively, you can quickly reach Amazon console by clicking “Amazon” button at the top of the screen. The number of active profile is displayed with green tag at the top of the amazon button. In order to active AWS cluster, click on “start” button of the profile you wanted to initiate. Following options will be prompted. Nodes: Enter the number of instances, you want to initiate. First node is created as master, and the remaining as workers. Use autoscale: This is Nextflow’s critical feature which allows the cluster to adapt dynamically to the workload by changing computing recources. After clicking this option and entering number of Maximum Instances, new instances will be automatically added to the cluster when tasks remain too long in wait status. The upper limit should be entered by Maximum Instances to control the size of cluster. By default unused instances are removed when they are not utilised. Inactive AWS cloud has not initiated yet. Waiting for reply Cluster request is sent. Initializing Cluster request is accepted and nodes are initializing. Running AWS cloud ready to submit jobs. Waiting for termination Cluster termination request is sent and waiting for termination. Terminated AWS cloud has terminated. Once the cluster initialization is complete, user@hostname will appear next to the running status as shown in figure below. On the run page, you should select your active amazon profile as a Run Environment and click “Ready to Run” button. When runs are complete, you can stop cluster by clicking “stop” button on Amazon Management Console. Profile status will be updated as Waiting for termination, and in few seconds it will be changed to Terminated as soon as confirmation is received.